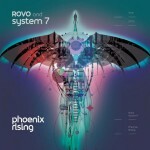 Share the post "Album review: ROVO AND SYSTEM 7 – Phoenix Rising"
Steve Hillage owes his unique position as the godfather of techno and an all-round psychedelic overseer – he’s a contributing musician, producer and DJ – to his psychedelic rock past and his innovative techno, trance and ambient filled present. He was one of the pioneers of electronic and psychedelic dance music who saw the connection between the two genres very early on. Having apparently ditched his rock career (a recent Gong re-union DVD aside), he went on to produce the early trance influenced Simple Minds before hooking up with the nascent dance music scene and forming System 7 with his partner Miquette Giraudy . It’s a fluid project that shifts its influences between techno, prog and trance. In a sense he’s never really changed, as he’s always been into head music, but the advance of technology has pushed him into the realms of samplers and sequencing allied with dance beats and layered grooves. So, in many ways it was a no brainer to hook up with Japanese psychedelic jam band called Rovo. When System 7 toured Japan, Rovo played some System 7 material and System 7 interpreted Rovo’s material with techno beats. The upshot was a collaboration that led to this album. ‘Phoenix Rising’ is a symbolic reference to the rebirth of post tsunami Japan, and most of the hyper, beat driven music reflects an uplifting mood. It’s an album on which cyclical beats and programmed sounds meet a jam band head-on to fill the hypnotic grooves. The album opens with ‘Hinotory’, the lead video of which is now re uploaded after copyright problems. A familiar Hillage space-rock intro and an intense drum duet lie at the heart of sculpted, layered sounds and trippy psy-trance beats, before a momentary pause gives way to the kind of tension breaking melody that is reprised later on the album. ‘Love for the Phoenix’ is a good example of Hillage’s ability as an arranger and is a reworking of ‘Habibi’, System 7’s 1991 debut single. It is almost unrecognizable from the original funky vocal track and is transformed into a hypno-groove instrumental with a trancy feel, but keeps the looped voice mantra that is reminiscent of the Swedish electro trip hoppers The Knife. A trancy ambient feel explores a subtle dynamic as the intense beats are pushed to the front of the mix. ‘Meeting of the Spirits’ draws on the Mahavishnu Orchestra’s opening cut from ‘The Inner Mountain Flame’. That band has been sampled many times, but it’s doubtful there’s been such a successful updating as this of their complex music with modern beats. The original guitar riff (ironically similar to the Canterbury sound of Hillage’s early contemporaries Caravan) leads into the kind of thrilling double lines featuring Rovo’s guitarist Seichi Yamamoto and violinists Yuji Katsui, that John Mclaughlin and Jerry Goodman used to share back in their 70’s heyday. The twin power house drums perfectly anchor an enveloping sound on which Hillage enjoys a flashback to Gong’s ‘You’ album, in a meeting of space rock and fusion influenced jamming. And it’s that essential uplifting rush that infuses much of the album with a ‘can do’ spirit, wholly in accord with the ‘Phoenix Rising’ theme. Rovo’s sparkling jam sensibilities and Hillage’s ear for sonic embellishments make this a unique album. ‘Cisco’ is a case in point. It clocks in at an impressive 13 plus minutes, and opens as an orthodox band piece, before evolving via psychedelic wah wah drones into a layered space- rock ambience, punctuated by exuberant percussion and shifting beats. It sounds like a meeting of early Hawkwind with modern technology. And after a quasi mid-number break down, the tempo suddenly speeds up at the 7.23 min mark to usher the rhythm section back into a mix of hard beats and a dense wall of sound. Only a disappointingly clumsy ending robs the track of its potential grandeur. ‘Unbroken’ offers light relief, on a perfect meeting of programmed beats with a live band, while ‘Sino Dub’ briefly evokes the Yellow Magic Orchestra before being immersed in manic beats that again clock in at over 13 minutes. The remarkable thing about this album is the way the two apparent antithetical musical processes come together to integrate modern technology with a jam led spirit. This entry was posted in ALBUM REVIEWS, ALBUM REVIEWS (Mobile), All Posts and tagged Caravan, Gong, Hawkwind, Mahavishnu Orchestra, Miquette Giraudy, Phoenix Rising, Rovo, Seichi Yamamoto, Steve Hillage, System 7, Techno, Yuji Katsui. Bookmark the permalink.